Another solid week of gains in the stock markets has the weekend market outlook showing green. Reports of progress on a trade deal with China seems to be the catalyst. Watch the $VIX; it's approaching 16, which has been a floor during the recent downtrend. And a short trading week this week, as US markets are closed Monday to observe Martin Luther King Day. Price and volume also looks positive, with prices back above the 50-day moving average and accumulation days outpacing distribution. Overall, trading volume is still below average, and lower than I'd expect for the speed with which market prices have rebounded. 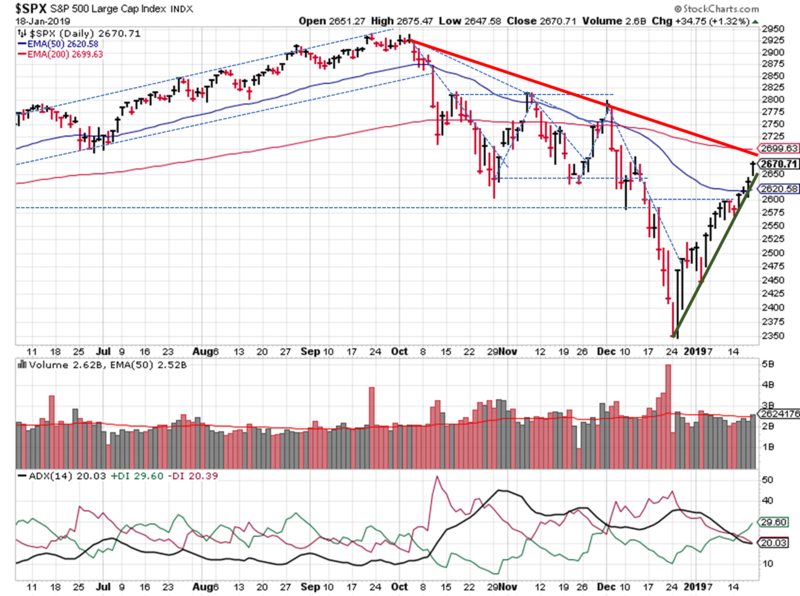 OEW is evaluating 5 criteria to determine if the market will retest the December low, or if the bear market has already ended: the size of rally, NDX/NAZ and SPX/DOW wave patterns, rebound percentage from the low, and breadth rise from the low. Right now, the size/percentage of the rally and NDX/NAZ criteria point to an end to the bear market, putting the odds of an uptrend at 60%. So this signal switches to an uptrend as well. Switching to a weekly view, prices appear to have broken the downtrend created in Q4. But there hasn't been a higher "low", in terms of closing prices yet, so it's hard to define the new uptrend. Weekly prices have closed at or near the high for the past 4 weeks, creating a steep trendline. 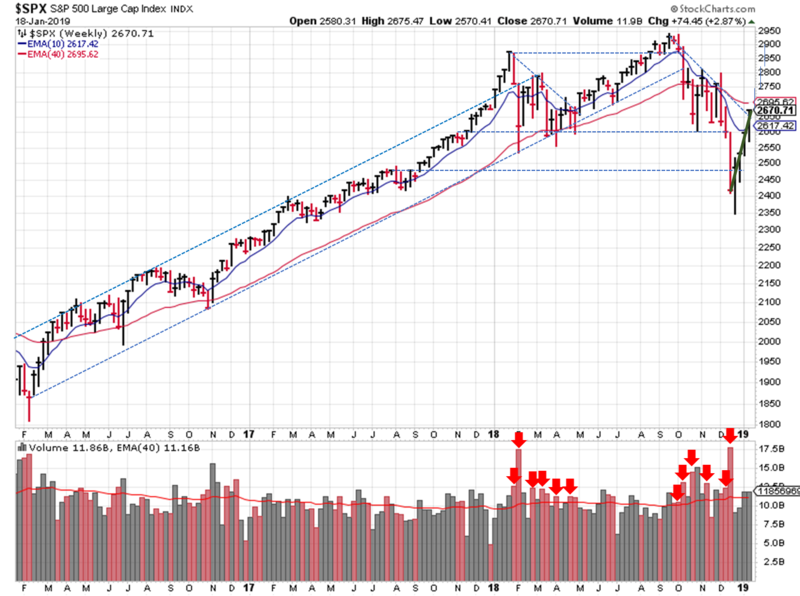 Even a trend drawn through the intra-week lows is steep. At this rate, the S&P would be back to the 2018 Q3 highs within the next 3-4 weeks! The situation reminds me of the last week in November 2018. 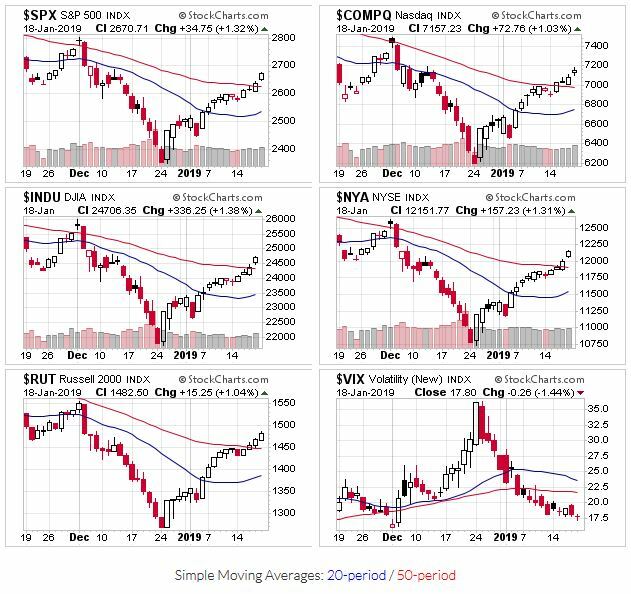 All the signals went green and everyone pointed towards a year-end rally. Then KABLAMO, prices dropped like a rock. It just feels like a whipsaw is coming, and within the next week or two, I'll be writing about a signal change again. Fool me once, shame on you. Fool me twice...participate and protect indeed.